Money Lover | Blog | What are the difference between Premium and basic version? What are the differences between FREE & PREMIUM version? We offer Money Lover freely with basic features. You can download and experience for free from App store. Here are basic functions of application. 1.Keep track of your money: track and categorize expense and income with ease. 2. Budgeting: Plan your monthly budgets to never overspending again and save more money. 3. Free Cloud service which empowers Money Lover to work seamlessly across devices. 4. Manage Debts, Loans & Payment process. 5. Overview Reports: Get insight about your spending and income sources to put your money on the control. With FREE version, users can only create two (2) Wallets, one (1) Budget, one (1) Saving campaign, and one (1) Event. All finished budgets, savings or events are also counted. UNLIMITED number of Wallets, Budget, Saving and Event. PREMIUM support from Support team. Premium version works across devices & platform. You by one time and get access on Android, iOS and Windows. It mean you can track your spending anytime, anywhere you go. You can use Money Lover Premium everywhere with any devices. Just login with your account. You love Money Lover, we believe you will love Money Lover Premium as well. 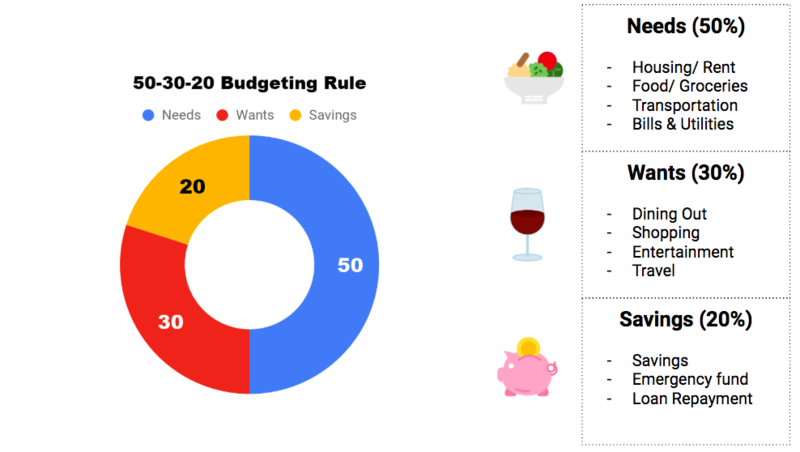 Read on: Understand 50/30/20 - simple budgeting rule that helps you save more.